Would you like your Android phone or tablet to be faster and prettier and easier to use? Nova launcher has done that for me. But wait, there's more! By installing Nova Launcher on all my devices, they will all work the same. I can configure my icons and apps the similarly on my tablet and my phone. When I get a new phone or tablet, it'll work the same way as the old one, and not give me fits trying to figure out how it does things. Android is an operating system like Windows, or Linux. On top of Android various suppliers like Asus, Samsung, LG, Google or Lenovo place a Launcher, which controls how you place and remove icons, how you find and launch your apps, what shapes things have and how you access your apps and widgets. It is a little like Android is the basic car, but each manufacturer adds on their own particular way of steering, filling the gas tank, using brakes, using a radio etc. Though the fundamental car may be the same, the user experience varies widely and it can be very difficult adjusting to the next one. However, what Android has done by making the launcher separate from the fundamental operating system, is open a market for hundreds of developers to create their idea of how it should be. We negatively experience this when we have difficulty setting up a new phone or tablet. We positively experience it when we find a launcher that really helps us make the phone or tablet do what we want better and easier than we thought possible. Or alternatively, when we change our phone around to be different when our mood changes. I wanted a launcher that was small, fast and pretty much used the standard Android way of doing things but made it a little better: a little faster, a little more control and a little easier. I wanted one that had millions of users and had been around for a few years and got rave reviews. The main thing you notice on a smart phone is the Desktops. Often there are two or three of them. They are the main part of the screen with all the icons on them. 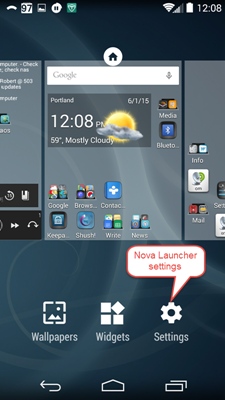 Pressing the home button twice, launches Nova options. You can then customize your device. This is what my desktop looks like when I press home twice. When I choose settings, it isn't the Google Settings, it is the special Nova settings. Desktop Grid Layout: This lets you decide how many icons will appear horizontally and vertically on your desktop. The more icons the smaller they are. Infinite scrolling. So on a 3 screen desktop, if you go left from 1 you get 3 and right from 3 gives you 1. One scroll effect I think is really cool is the cube effect. So here you can see that when I scroll from one desktop to another it gives the 3D effect of a cube. You can also control the look and feel of the Dock (that area on the bottom that stays the same on all of your desk windows. I like the platform look, where it seems three dimensional, like the icons are on top of the dock. The launcher also lets you easily decide how your App drawer (where you see all your apps) and Widget drawer (where you see all you widgets) looks and acts. How big should the icons be? How many per page? Should it scroll horizontally or vertically and so forth. 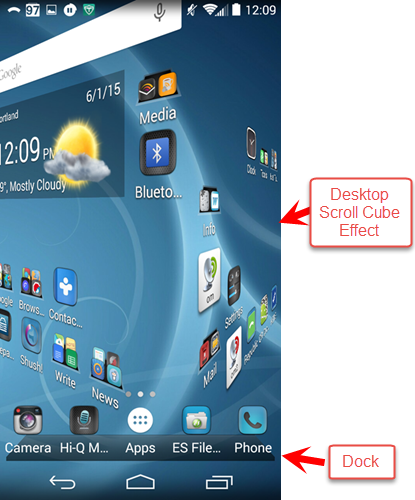 I've found this launcher allows me to make my devices more my own working the way I want them to. It also makes them better looking and a little easier to use. It'll be one of the first apps I install on new devices.